Peach County was created in 1924 from Macon County and Houston (not to be confused with Houston, Tx pronunciation). This is house' ton County, Georgia. Georgians have their own language. If you asked my mother (born there in1906) about the naming of Fort Valley, you would have heard, "It was supposed to have been named Fox Valley. Someone goofed and it became Fort Valley. Others disagree and say it was named for a friend of James Everett, Arthur Fort who was a Revolutionary War hero who was from Milledgeville, a town nearby. I lean toward my mother's explanation since no fort has been found there. 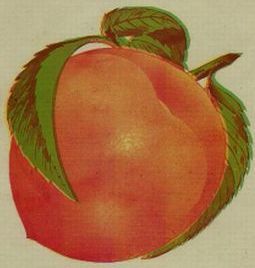 Peach County was known for the Peach Blossom Festival. Held in Fort Valley, the county seat, it was the largest festival in the 1920's anywhere around. The number of people that volunteered their time and effort is shown in the 1922 Souvenir Program. The early Peaches knew how to put on a spread. They dug the trenches to cook the meat in that seemed to go on for a mile. This was a shortlived festival. They did it so well that an estimated 40,000 people attended one year from all over the world. It only ran from 1922- 1926. In recent years, again there is a Peach Festival. Not on the same scale as the previous one. Times have changed and different events have been instituted. These folks were an industious bunch. Two brothers began in a garage behind the house building scchool buses. They turned it into quite a business.The BlueBird School Bus business was born in Ft. Valley. Agricultural pursuits have been a main stay of the county. Not only are peaches the #1 crop but there are several others that have been progressing steadily, growing in production. Pecans, Chestnuts, Walnuts, Dwarf Apples, and Plums are also grown commercially in Ft. Valley.